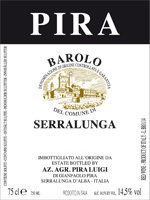 The Barolo DOCG Serralunga of Luigi Pira is a garnet color with orange reflections. The nose is a classic barolo, good freshness, elegant in its hints of leather, hay, earth and spices. The palate is a right softness wine, balanced acidity and tannins, and good length. Perfect accompaniment for roast meats, game, cheeses. 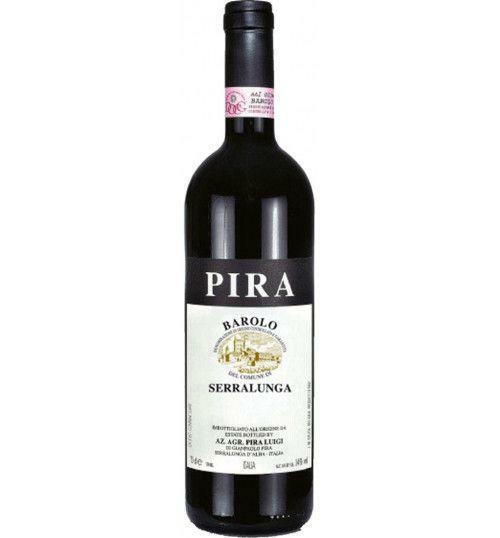 THE WINE The Barolo DOCG "Serralunga" of Luigi Pira is a garnet color with orange reflections. The nose is a classic barolo , good freshness, elegant in its hints of leather, hay, earth and spices. The palate is a right softness wine, balanced acidity and tannins, and good length. Perfect accompaniment for roast meats, game, cheeses. 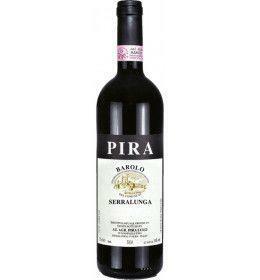 THE COMPANY In the name of barolo , the Pira family has been tied to the hills of Serralunga d'Alba , a land of great wines, since the late 19th century. In the 50s Luigi Pira decided to focus on grapes and wine, in the following decades he sold grapes and open wine to the biggest wineries in the area of Alba which sought after high quality products from Serralunga d'Alba. It was a first step towards its own production, which was impressed in this earth and able to give great red wines, Barolo above all. In the early 90s Gianpaolo, Luigi's son, started to take part in the winery management, and the wine quality became the key factor. Today Gianpaolo is flanked by his brothers Romolo and Claudio. Over the last few years the winery has focused on two main aspects: on the one hand they have bet on a wine which reflects the grape quality attained thanks to the special characteristics of the hills of Serralunga d'Alba, in the very heart of the Barolo district. On the other hand they have developed their marketing potential based on quality with the collaboration of Marc De Grazia. The market has rewarded this approach, especially in Europe and North America. Ties with the territory, quality and selection: this is the Barolo by Cantina Pira Luigi in Serralunga d'Alba. Before 42,86 € tax incl. Tasting Garnet red color with orange reflections. The nose reveals a classic Barolo, fresh and elegant in its notes of leather, hay, earth and spices. On the palate it is round, well balanced between acidity and tannins, very persistent. Service temperature 17° - 18° C.
The Barolo DOCG "Serralunga" of Luigi Pira is a garnet color with orange reflections. The nose is a classic barolo, good freshness, elegant in its hints of leather, hay, earth and spices. The palate is a right softness wine, balanced acidity and tannins, and good length. Perfect accompaniment for roast meats, game, cheeses. In the name of barolo, the Pira family has been tied to the hills of Serralunga d'Alba, a land of great wines, since the late 19th century.